In a few short weeks, my son turns from tween to teen, which means he’s no longer free to say, “Sure, I’ll see the kids’ menu.” Of course, if you know my kid, you probably know he’s been saying, “No thanks, I’ll have the regular menu!” since he was a tot. He’s also the only 12-year-old I know who’s willing to wait an hour — without complaining too much — for a seat at the counter at his favorite restaurant, Delancey. Anyway, in preparation for next month’s restaurant roundup, here’s my burning question: What’s your kids’ favorite restaurant? And which among them do you actually like taking them to? 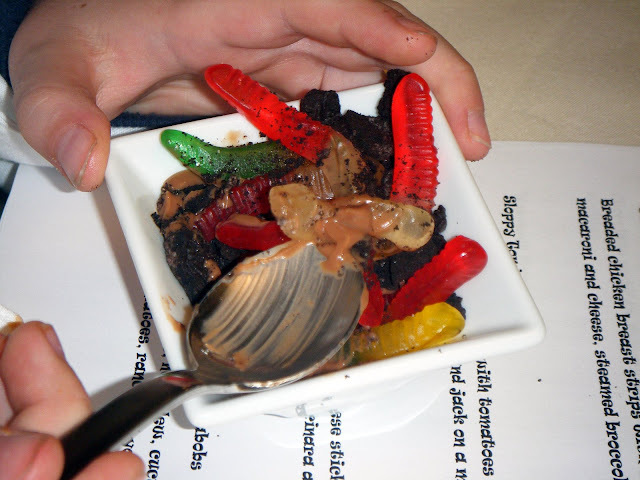 Just desserts, kid-style: Nate was a big fan of these Gummy Worms in cookie-dirt (among other eats sampled at Suncadia) back when the resort was testing their new childrens’ menu on a group of willing young guinea pigs.